As I've acknowledged before, I'm something of a Star Wars traditionalist. If you're going to tell me a Star Wars story, let's have it star Luke, Leia, and Han, please, or even the prequel trilogy characters in Clone Wars. 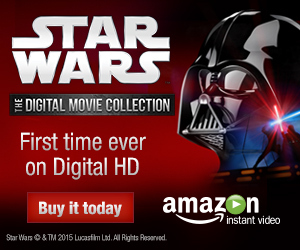 Though neither Lost Tribe of the Sith nor Dawn of the Jedi were bad stories, my interest is not as focused when the characters aren't familiar or even the familiar trappings of Jedis versus the Sith or the Empire aren't present, as was the case in these stories set in Star Wars's ancient past. Star Wars: Legacy II Vol. 1: Prisoner of the Floating World is a different beast, the first Star Wars comic I've read now set in Star Wars's future. More familiar trappings are here and as such I was more comfortable with the story. It takes a little re-reading to get straight the Imperial Court versus the Jedi Council and Galactic Alliance, but once that's done, Prisoner settles down to a story of a kid on a backwoods world whose life is upturned by the battles of Jedis and Sith, a la A New Hope, and from there Prisoner is a fairly accessible Star Wars book. It helps considerably that the book stars one Ania Solo, and advertising for this volume makes sure the reader understands her connection to Solos past. Seeing what Ania will do, and spotting the little "Solo" references throughout the story, is what drove me for much of this tale. But this is also the book's downfall, because ultimately Ania Solo's past bears little on Prisoner (though it's foreshadowed it may factor in to the next volume); those who read to the end hoping for a definitive connection between this series and Star Wars classic will be disappointed. Ania Solo, Dark Horse's advertising copy for Prisoners will tell you, is the great-great granddaughter of Han Solo and Princess Leia Organa. Any self-respecting Star Wars fan knows what that means -- she's a little bit country, a little bit rock 'n' roll, a little bit roguish smuggler, a little bit Force-user. Creative team Corinna Bechko and Gabriel Hardman err more toward "roguish smuggler," at least in this volume, punctuated toward the end of the first issue with a "Han shot first" moment that leaves no doubt who Ania takes after. And again, junk-dealer Ania's humble beginnings on a desert planet, the droid with an urgent message that spurs Ania to help rescue a captured Jedi, the revelation of a new Darth, and on and on, all strongly (and no doubt purposefully) evoke A New Hope here. Even though Bechko and Hardman put a lightsaber in Ania's hands early in this book, never once that I saw do they hint at any innate Force powers that Ania must have. Perhaps this is wise, because having Ania immediately take to the Force might be too obvious, but the result is essentially a Han Solo-type story and not a Star Wars story. There are two Jedi here, and lightsabers flash in their climactic battle with Darth Wredd, but given how one Jedi is essentially a prisoner for most of the story, it's hard to empathize with their characters or to feel as connected to them as the reader does with Ania. Despite that there's no solution here, the creative team builds an interesting mystery around Ania. She may be denying her heritage, but she's not unaware of it. One of the more compelling supporting characters here is the droid AG-37; when he encourages Ania to live up to the example of her family, she replies, "Do I look like royalty?" At the same time, Empress Fel's closing question in the book -- "Who the hell is Ania Solo?" -- suggest the Solo "royalty" is not galaxy-renown. I'm curious how the creative team will reconcile this (who is Ania Solo, indeed? ); I'm also interested to know more about AG-37 and his connection to Han Solo, given that AG-37 is essentially our best link to classic Star Wars in this book. Though my experience with Star Wars comics is limited, I'd venture that series artist Gabriel Hardman's style is unusual for such a book. Whereas the art in other such books has been more animated (though not necessarily cartoony), Hardman's is a dark, grittier style, with shades of Michael Lark. Legacy is not a dark or depressing story per se, but the rougher art still works to give the book a much-needed maturity. The beginning of Legacy is largely the story of two children, Ania and her Mon Calamari friend Sauk, running around (think Phantom Menace), and it would have been easy to turn this into a "young readers" book with the cartoony art of someone like Jeff Moy, for instance; Hardman helps immeasurably in making this seem like "serious" Star Wars. Star Wars: Legacy II Vol. 1: Prisoner of the Floating World is an enjoyable story with some dynamic action sequences, especially when the characters take to starships or speeders. It lacks a little oomph in telling a mostly-familiar story that fails to touch on the book's most salient point, Ania Solo's background, but there's hints the second book might take that up. 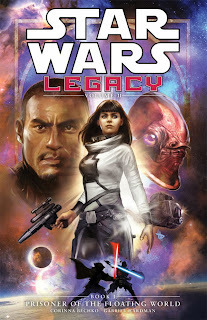 Very possibly this new iteration of Star Wars: Legacy will be one that needs the first and second books read together to really make its impact. Next week is a double-shot of Batman and Robin; don't miss it!